Sonia Roe, 81, of Junction, woke to see the face of Jesus on Wednesday November 7, 2018 while visiting family in North Carolina. ​Sonia was born in Eldorado on November 2, 1937 to the late John and Oberene (Ratley) Hafford Noles. 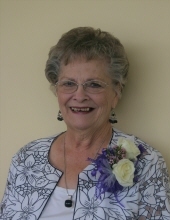 She was a member of the Eldorado First Christian Church and devoted teacher and faithful participant in the Berean Class. Sonia worked at First State Bank and also in the Eldorado School system in the cafeteria. ​Sonia loved to share quotes with friends and family. In one of her family books, she wrote, "Our family is a circle of strength and love, with every birth and every union, the circle grows. Every joy shared adds more love, every crisis faced together makes the circle stronger." ​She is survived by her children: a son, Jon (Mary) Lambert of Burns, TN, two daughters: Beth (Ken) Penfield of Kahoka, MO and Lisa (Lee) Mitchell of Clinton, TN. Also surviving are 6 grandchildren: Leah (Andrew) Jinks of Joplin, MO, Adrianne (Ricky) Adams of Elizabeth City, NC, Aaron (Matti) Penfield of Tennessee, IL, Jonathan (Kelly) Lambert of Santa Fe, TN, David Lambert of Knoxville, TN, Connor Mitchell of Clinton, TN and a step-granddaughter, Misty Howton of Carmi, IL as well as many grandchildren she "adopted" from Shiloh Christian Childrens Ranch. Sonia was preceded in death by her husband, Louis Roe, and granddaughter, Bethany Gayle Penfield. ​Funeral services will be held on Monday, November 12, 2018 at the Watson Funeral Home at 1:00 pm with Dennis Robison officiating. Burial will be in Wolf Creek Cemetary. Visitation will be held from 10:00 am until service time of 1:00 pm at the funeral home. ​For those who wish, memorials may be made in her memory to Wabash Christian Retirement Center or Shiloh Christian Children's Ranch and may be left at the funeral home. To send flowers or a remembrance gift to the family of Sonia Roe, please visit our Tribute Store. "Email Address" would like to share the life celebration of Sonia Roe. Click on the "link" to go to share a favorite memory or leave a condolence message for the family.